Hi there, friends! I’m sharing some SUPER awesome news I’ve been waiting to share for a while…..
Oh LOOK! That’s me, Lil’ Inker Designs new Social Media Director and Design Team Member! SQUEEEEEE! This is such a perfect fit for me with my marketing background. It’s like Laura and I are long lost sisters already. Can’t wait to see you over on Facebook, Twitter, Instagram and the blog, I’ll be chatting it up. I am so thrilled to be joining this amazing team, starting with showcasing this month’s super sweet new products. Lil’ Inker Designs has a fresh new look as well! If you have arrived here from Amy’s blog, you are in the right direction. If not, start back at the Lil’ Inker blog to find the entire hop list from the beginning. 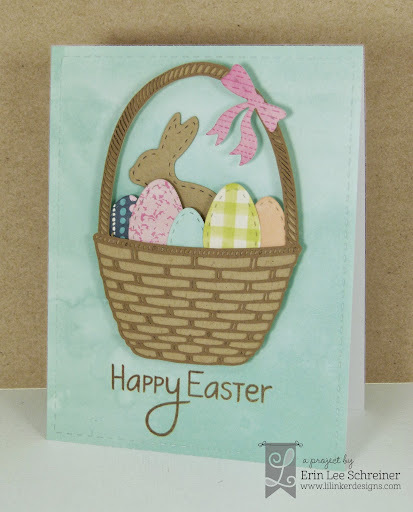 For this card, I used Stitched Rectangle Dies, Spring Sentiments, Bunnies & Bows Die Set and Spring Flowers Die Set. Don’t forget to leave comments on the blogs for your chance to win one of THREE $15 gift certificates to use in the Lil’ Inker Designs store! Your next stop along the hop is my talented friend Heather. Can’t wait to see you over on the Lil’ Inker Designs Facebook, Twitter and Instagram pages, I’ll be chatting it up!